Willows come in all sizes and when you see the little shrubs of Salix repens growing in dunes you could be forgiven for think that willows can't get much smaller than that. Salix herbacea grows on the floor of the saddle and towards the Corrie on Ben Lawers and is so insignificantly small that you walk on it. It can be a little larger but at this site the willow spreads as ground cover without reaching much more than 2 cm in height - the small tufts of grass nearby give an idea how low to the ground this "tree" grows. 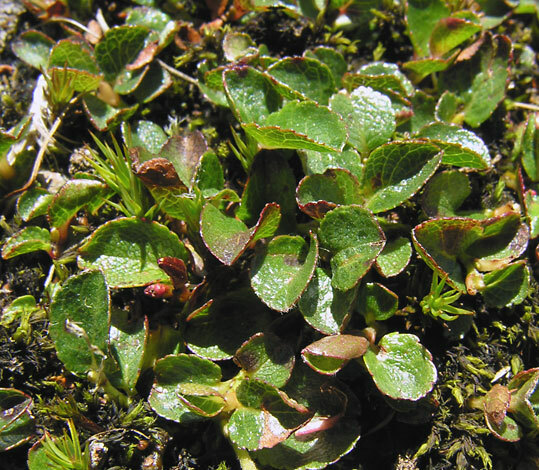 In mainland Britain Salix herbacea is a northern hill plant predominantly but it is found in Snowdonia and the Brecon Beacons in Wales, and some northern English hills too. In Ireland it is a plant of the western coastal hills.